We all know that the iPhone is no ordinary phone - it's also arguably the best iPod Apple has ever made. Its gorgeous widescreen display is perfect for watching movies on your daily commute. We're going to show you how to get them on there. Ready? Yes, we know. It's kinda obvious, but it's also incredibly easy. Grab a movie from the download store and it's ready to watch on your iPhone. iTunes Store videos have a resolution of 640 x 480 pixels so you can also watch them on your regular Mac or PC too. Buying movies is a tad pricey right now, but renting makes perfect sense. You pay just £3.49 for recent hits like Cloverfield - and you don't have to convert it into a format the iPhone or iPod Touch understands either. Rentals from the iTunes Store don't have to be watched right away. You have up to 30 days to start watching each title you download. This enables you to queue up a whole bunch of movies ready for your daily commute. However, once you start to watch a movie you have 48 hours to finish it before it disappears into the ether. It's probably best not to start watching The Lord of the Rings trilogy then if your commute only takes 10 minutes. Isn't ripping movies forbidden? We don't normally do this, but we're now going to paraphrase a bit of Star Wars for you - we cannot possibly condone a course of action that could lead you to war (with the authorities). Ripping DVDs that you own is totally, utterly, unquestionably illegal in UK law. 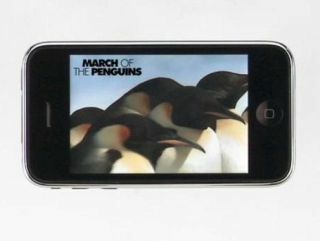 There is no place for place-shifting, which is what ripping a movie to your iPhone is. PC Plod is unlikely to look favourably on your weasely excuses, and there is no Fair Use clause yet. Move to the USA if you want to use that as your defence. Even then it might not work... just look at the furore over Real Networks' Real DVD software this week. One piece of Mac software that exploits the US's Fair Use legislation is Metakline's FairMount. It can create clones of your DVDs, ostensibly for backup. Team the resultant Video_TS folder with the VLC media player and you get DVD playback on your computer. The only thing you need to do then is convert it into a format that the iPhone understands. DVDRemaster,also from Metakline, is ideal. If you have a movie file you want to convert you could do worse that get iTunes to do the conversion for you. Yes it can be grindingly slow, but it will give you the results you seek and it's so easy even your Gran can do it: Simply select the movie you want to convert then go to Advanced > Create iPod or iPhone version. Now go off for a leisurely cup of tea or 10 while it does the biz.